I have to admit, I find most photos posted to Reddit Gets Drawn kinda boring; sure, I need practice, but selfies bring out the old man snob in me. Back in my day, we expressed ourselves through Transformers action figures, and we liked it. Anyway, I appreciate it when people post something that’s fun to sketch, like this. 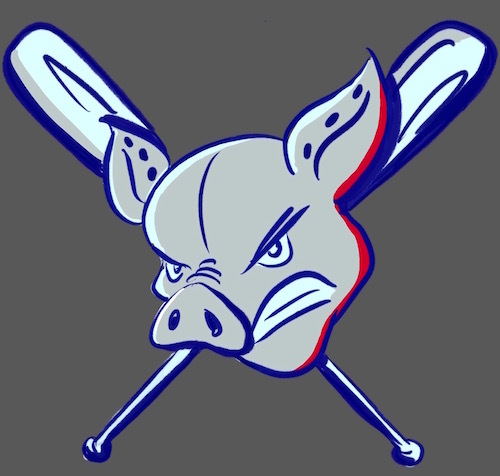 My brother-in-law requested a logo for his company’s baseball team, which is named after a minor league club branded with a similarly metallic and ornery oinker. So yeah, in terms of the basic concept (and color scheme), this is a total rip-off, but the cartoony head, for whatever it’s worth, is all mine. I worked on this from start to finish on my iPad Pro. The initial sketch (below) was done in Procreate, and the vector art was done in Autodesk Graphic, formerly known as iDraw. The first thing people often noticed about my favorite coworker was that her office chair was an exercise ball. Today, she made a move that was both gutsy and rational: leaving her post simply because she was ready for something new. Does she have a new job lined up? Nope. Will she succeed? Yep. From what I understand, a lot of actual artists use thumbnail-sized sketches to work out their compositions without getting too bogged down with detail. Perfect use for my new 3.5″ x 2.5″ pad. Next stop, grains of rice!